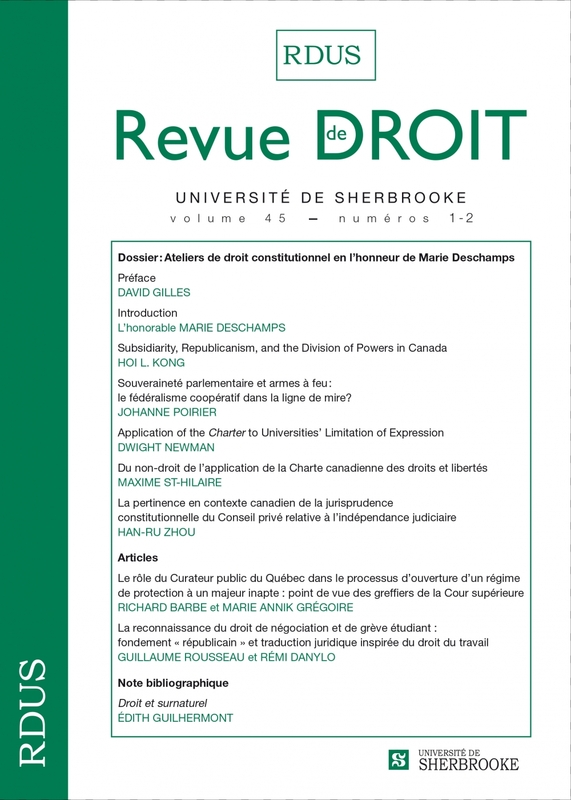 "La pertinence en contexte canadien de la jurisprudence constitutionnelle du Conseil privé relative à l’indépendance judiciaire" (2015) 45:1-2 RDUS 235. This article examines the “unwritten” or implied constitutional principle of judicial independence from a comparative perspective. The exercise of judicial review on the basis of such principles is not unique to the Canadian context. Indeed, for more than half a century, the Judicial Committee of the Privy Council has been examining the conformity of laws to implied constitutional principles in cases from Commonwealth countries which, as in Canada, have adopted a Constitution based on the “Westminster Model”. This Privy Council case law suggests that the position of the Supreme Court is far from being as exceptional as one would have initially thought. Rather, the Supreme Court case law fits with a more global trend within the Commonwealth of using implied constitutional principles, in particular judicial independence and the separation of powers, in conducting judicial review of legislation. It follows that the proposed comparative analysis would have provided the Supreme Court significant support for its position regarding the constitutional extent of the principle of judicial independence. This content has been updated on 5 July 2017 at 14 h 50 min.